PunchyWhere is the vaccinator icon located in the res files? HudMedicCharge.res, ResistIcon. As for team-colored ammo, i doubt it's possible. [quote=Punchy]Where is the vaccinator icon located in the res files? [/quote] HudMedicCharge.res, ResistIcon. As for team-colored ammo, i doubt it's possible. Hit a bit of a snag, I want the color of the meter to be a dark grey, but I can only change the color of the bg. Don't set a font for delta_item_font and delta_item_font_big; leave them blank. Any ideas how to add it in? Which files to modify etc? I can't find the option anywhere to adjust that percentage counter to the right, any help would be much appreciated. Thanks! To move everything related to medic's uber (the bar in the middle, the big percentage, the small percentage) open up HudLayout.res and ctrl+f for HudMedicCharge. To move one of those things open up HudMedicCharge.res and move whichever element you'd like. To move [u]everything[/u] related to medic's uber (the bar in the middle, the big percentage, the small percentage) open up HudLayout.res and ctrl+f for HudMedicCharge. To move one of those things open up HudMedicCharge.res and move whichever element you'd like. Sorry but could you explain in a bit of a clearer way what it is that you want? Do you want RaysHUD with only health numbers? Or with numbers and a cross, or the cross with the small numbers. I don't know if this was already answered (it didn't come up when I used the search bar either) but how do I make the damage indicator display a different color based on whether I did damage or healing? The numbers that pop up near the target are either red or green, but I can't do the same for the second number. Also, and I may figure this one out myself by the time someone answers the first part of my post, how do I make the number on the hud stay until the next one? Currently mine disappear at the same time as the ones that appear near my target do. McstickenI don't know if this was already answered (it didn't come up when I used the search bar either) but how do I make the damage indicator display a different color based on whether I did damage or healing? The numbers that pop up near the target are either red or green, but I can't do the same for the second number. Can't check it atm but in huddamageaccount there's "PositiveColor" and "NegativeColor", very sure that healing is positivecolor and negativecolor is damage. [quote=Mcsticken]I don't know if this was already answered (it didn't come up when I used the search bar either) but how do I make the damage indicator display a different color based on whether I did damage or healing? The numbers that pop up near the target are either red or green, but I can't do the same for the second number. _Kermit McstickenI don't know if this was already answered (it didn't come up when I used the search bar either) but how do I make the damage indicator display a different color based on whether I did damage or healing? The numbers that pop up near the target are either red or green, but I can't do the same for the second number. That doesn't work for the number that's on my hud, only for the one that pops up near the person I hit/healed. [quote=_Kermit][quote=Mcsticken]I don't know if this was already answered (it didn't come up when I used the search bar either) but how do I make the damage indicator display a different color based on whether I did damage or healing? The numbers that pop up near the target are either red or green, but I can't do the same for the second number. You know how when you hit someone your crosshair will turn red? Where can i find the file to edit that? Mine seems to be off center with the middle now and i need to fix it. PunchyYou know how when you hit someone your crosshair will turn red? Where can i find the file to edit that? Mine seems to be off center with the middle now and i need to fix it. 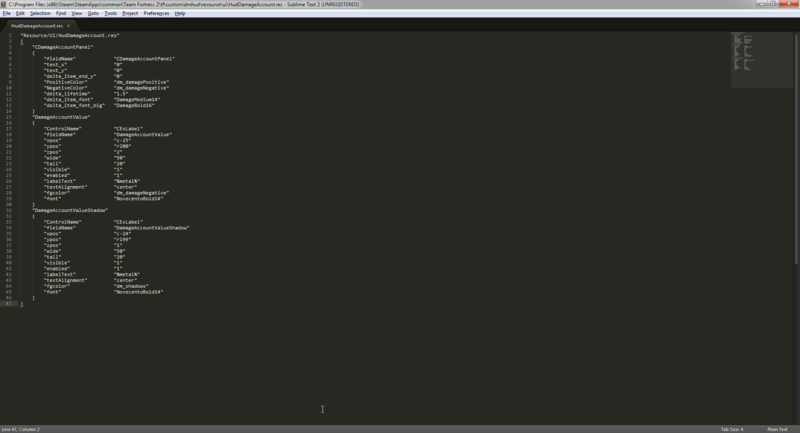 HudLayout.res in the scripts folder, no idea which crosshair though. If you want to edit the actual flashing in the future that's in HudAnimations.txt in the same folder. In hudanimations search for event DamagedPlayer. 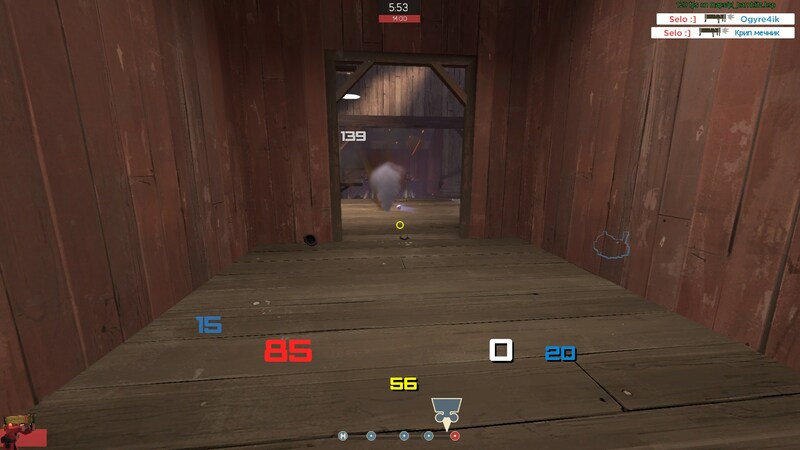 Hi, Im new to tf2 hud editing and recently started trying bwhud I like it but whenever I damage someone the damage indicator flashes in the middle of the screen. If you can help me change it to beside my health that would be awesome. 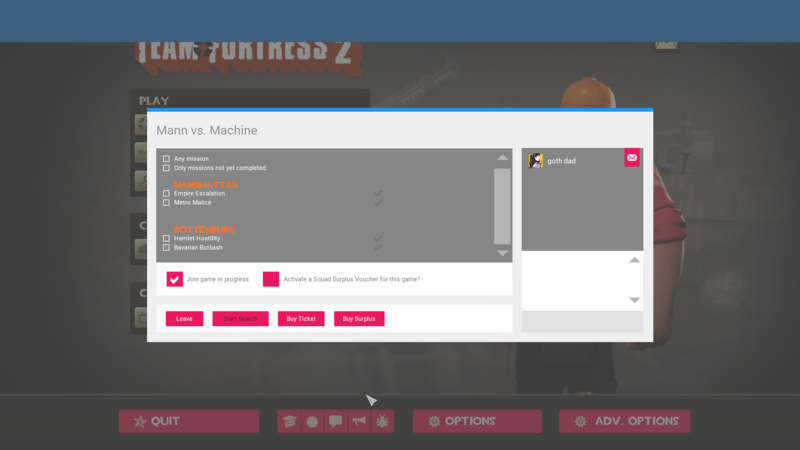 And if you could tell me how to move my chat to the top left that would be awesome! Jump on the hype train boys! 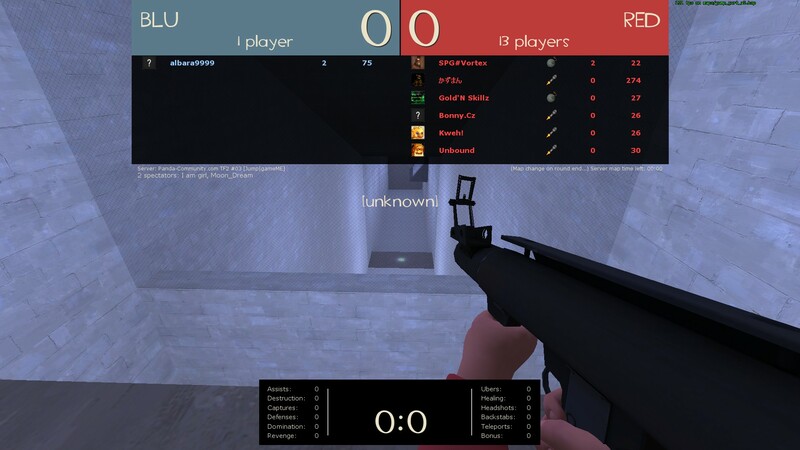 Matchmaking HUD additions Jump on the hype train boys! Don't want to be the guy bursting all the fun, but that's been in ClientScheme.res for at least a year. I've got a folder extracted from December 2013 with that in the ClientScheme. Hey guys! I can't found command in StatusSpec's F.A.Q. for enabling health bars... Help please :c Maybe it's not StatusSpec? Image from RebelConquer stream. Im trying to update thwartskihud but i cant figure out how to remove the big [unknown] in the middle of the screen, anybody know how i do that? DisquseHey guys! I can't found command in StatusSpec's F.A.Q. for enabling health bars... Help please :c Maybe it's not StatusSpec? Image from RebelConquer stream. [quote=Disquse]Hey guys! I can't found command in StatusSpec's F.A.Q. for enabling health bars... Help please :c Maybe it's not StatusSpec? Image from RebelConquer stream. Jerm DisquseHey guys! I can't found command in StatusSpec's F.A.Q. for enabling health bars... Help please :c Maybe it's not StatusSpec? Image from RebelConquer stream. [quote=Jerm][quote=Disquse]Hey guys! I can't found command in StatusSpec's F.A.Q. 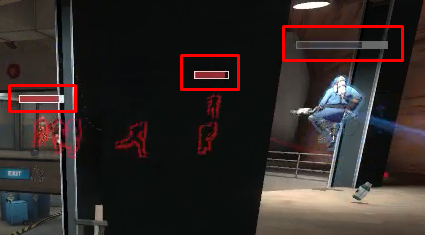 for enabling health bars... Help please :c Maybe it's not StatusSpec? Image from RebelConquer stream. I'd like to know how I can add an outline to my health number, as well as change the position, colour and size of the number that pops up whenever you receive health. SeloI'd like to know how I can add an outline to my health number, as well as change the position, colour and size of the number that pops up whenever you receive health. [quote=Selo]I'd like to know how I can add an outline to my health number, as well as change the position, colour and size of the number that pops up whenever you receive health.